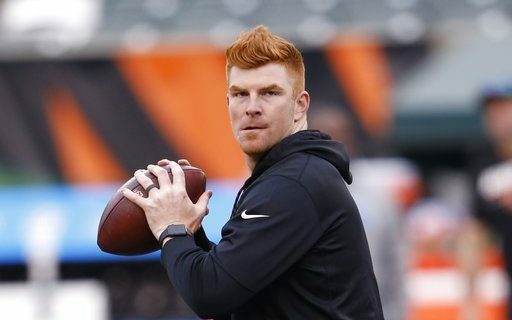 Today will be the triumphant return to Buffalo of Bengals Quarterback Andy Dalton. Since he threw the TD pass that put the Bills into the playoffs, Buffalo fans have been thanking him by donating to his foundation. They will likely thank him again with cheers at the Bills-Bengals preseason game. But sports humorist Jeff Wozer has discovered other ways that WNY is thanking the Red Rifle. • Fowler’s Chocolates now selling boxes of Sponge Andy. • The Pegula’s, as a small token of thanks, offered to buy him the Cincinnati Reds. • Channel 4’s Don Postles dyed his arm pit hair red. • Erie County Fair officials offered first dibs on unclaimed crap in its lost and found bin. • Chris Collins offered free stock tips. • Attorney William Mattar generously offered to represent Dalton not only if he get hurts in a car, but also while on a scooter. • Bills Mafia godfather vowed to bust the legs of any associate who doesn’t wait until after the opening kickoff to start cursing him. • The Broadway Market presented him with a buttered Bengal devouring a buttered lamb. • Wing King Drew Cerza gave him a used Bev-Nap autographed by Joey Chestnut. As for the quarterback who actually plays in Buffalo, Jeff has uncovered Josh Allen’s pet peeves about the NFL.